- city girl diaries -: see you in Santorini!!! i've first become curious about Greece when i've seen "Sisterhood of the Traveling Pants" several years ago. it's the place where alexis bledel went for vacation. i really liked its clean blue waters, and white stone houses. just a few months ago, i've watched "Mamma Mia" in the cinema, and i loved Greece even more!!! this is when my whole SANTORINI addiction started. so yeah, the name of the exact place in Greece is Santorini. this time, i loved Greece super duper even more and more! haha. it's that pretty sunset i'll always adore. shox, how could a place be this romantic?!? 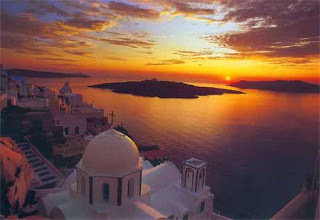 actually i find Santorini a perfect place for either a honeymoon or soulsearching. waah i really wanna go there! i promise i'll save enough for a trip to Santorini! my friends and i even have plans to go backpacking so we won't spend a lot as we explore the place. hmm i think it will cost each of us more or less Php 70,000 for 3 days and 2 nights in Santorini. it's a package actually. but there are no direct flights to there from the Philippines so separate plane ride will cost us more. shox! for more Santorini pictures, click HERE.